I was going to be doing activities with the book, "The Mitten," by Jan Brett, but one of my children has been talking about hibernating animals so we are turning in that direction. When he brought it up today, we talked about why the animals hibernate, sighting some of the different reasons. We then went into some animals that are awake and what we could do for them. This led us to the birds that have a hard time finding food in the winter. So we made a bird feeder. This bird feeder is very child friendly--no mess, no worry of peanut allergies. One year we went to our local zoo during their Christmas festivities and they had these there for the children to make. I thought they were great. 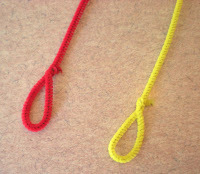 Each child can pick a pipecleaner color they like. I then loop one end. 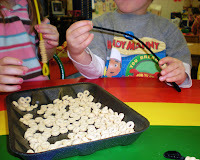 Now they can begin putting the Cheerios on the pipecleaner. 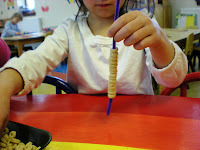 This is a great fine motor activity. I am always surprised at some of the children that have trouble with this. 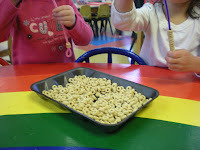 After the children have put the Cheerios on, I loop the other end. If they like, I let them make more than one. Some children leave with up to 4, while some have trouble finishing one. 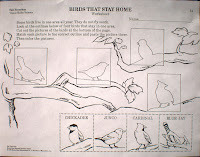 The bird feeder then gets hung on a tree, bush, or anywhere outside. It may take a while for the birds to find them. I have always hung mine in our forsythia bushes, sometimes they may still be there when spring begins, but they eventually get eaten. I also had out a cutting, matching, and gluing activity out on one of the tables during free time in case anyone was interested. I thought it appropriate with our bird theme. The book w e read today really had nothing to do with birds, but it is one of my favorite winter books! 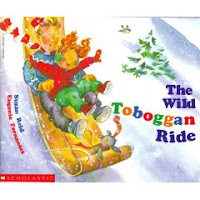 The book is called "The Wild Toboggan Ride," by Suzan Reid, illustrated by Eugenie Fernandes . In this story a grandfather and granddaughter are out with her toboggan. She wants to keep riding, but Grandpa Dan is cold and ready to go inside. Grandpa Dan tells Nikki she can have one more ride. As he is getting ready to push her down the hill, his long scarf gets caught and he falls on the toboggan. It is a cute story and the kids think it's pretty funny too. I love this!! 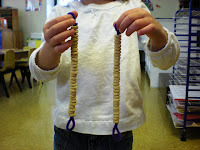 How simple, but what a great idea for fine motor skills! And you can eat the cheerios while you work. Thanks! Thanks so much for this great idea!!!!! I have kids with peanut allergies and was concerned about doing the traditional pinecone, pnut butter, seeds combo. This is a great solution! 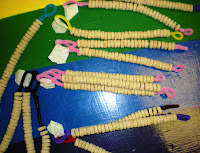 Will the squirrels take the pipe cleaner feeders or eat them? 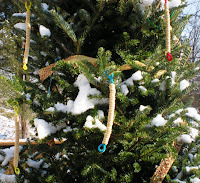 I actually don't know if the squirrels will take the pipe cleaner. I am sure as long as it is tied well to the tree they may not be able to get it off. Thanks for reading.